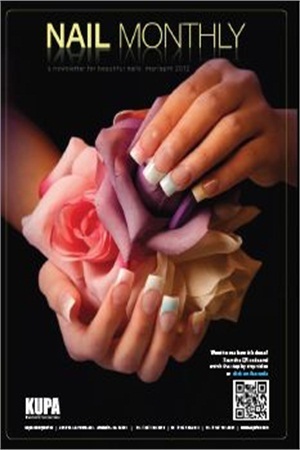 A bimonthly e-newsletter, Nail Monthly for Beautiful Nails by Kupa Inc. features gorgeous shots that offer QR codes to download videos on how the cover was done, along with a full-page profile on the cover artist and details on the products used. A bimonthly e-newsletter, Nail Monthly for Beautiful Nails by Kupa Inc. features gorgeous shots that offer QR codes to download videos on how the cover was done, along with a full-page profile on the cover artist and details on the products used. Also included is a letter from the president, Kupa news, product specials, show and class calendars, and a special feature article by Vicki Peters. And it’s free — just sign up on www.kupainc.com.